"Soundies" can be considered the precursors to music videos. Produced during the years 1940 to 1946, "Soundies" were made to be seen on self-contained, coin-operated, 16mm rear projection machines called Panorams located in nightclubs, bars, restaurants and other public places. Eight "Soundies," featuring a variety of musical performances, were generally spliced together on a reel which ran in a continuous loop. The Panoram, a complicated and unique machine, later served as the basis for the RCA 16mm projector. "Soundies" were produced by various companies such as Minoco and RCM Productions, a company formed by James Roosevelt (the son of Franklin D. Roosevelt) songwriter Sam Coslow, and Herbert Mills, a pioneer in the development of arcade music machines. In order to achieve the widest possible distribution, "Soundies" covered the gamut of musical styles from country and western to Russian balalaika music, tenors singing Irish folksongs, the big band swing music of Stan Kenton and Tommy Dorsey and jazz greats Count Basie, Duke Ellington and Nat King Cole. Included in the collection at the UCLA Film & Television Archive are Spike Jones and his City Slickers, Thelma White and her All Girl Orchestra, Noro Morales and his Orchestra, and Fats Waller performing numbers like "Drink to Me Only With Thine Eyes," "Don't Get Around Much Anymore," "The Hokey Pokey Polka," "I Cover the Waterfront," "A Zoot Suit" and "The William Tell Overture." 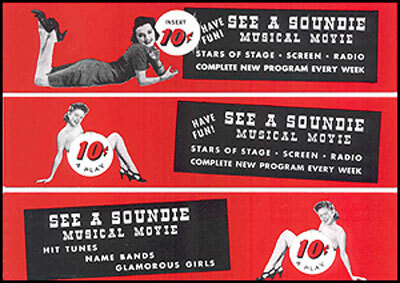 A "Soundie" reel sometimes included cheesecake segments—striptease, burlesque routines or shots of women in bathing suits—specifically intended to attract wartime military personnel on leave. Appeals for war bonds and other patriotic messages ("We're All Americans," "When Hitler Kicks the Bucket," "The White Cliffs of Dover,") were included. "Soundies" often starred little known performers who later became famous, such as Alan Ladd, Cyd Charisse, Doris Day and Ricardo Montalban, as well as performers on their way down. Many African American performers like Dorothy Dandridge, Louis Armstrong and Stepin Fetchit, who were largely absent from mainstream films except in minor roles, were featured. The Archive's Media Licensing department releases "Soundies" footage to a variety of clients.